Feeding areas. They’re the holy grail for carp anglers. Find one and you know you’re in for a busy session. Miss them, and it’s going to be slow going. Deeper sonars are a handy new tool that can help you in your quest for the perfect hotspots – just a few casts and you’ll get a complete picture of the features in your swim. They take the guess work out of feature finding, especially if your time is limited for using a marker float and lead. Plus, you get a record of every scan you make. 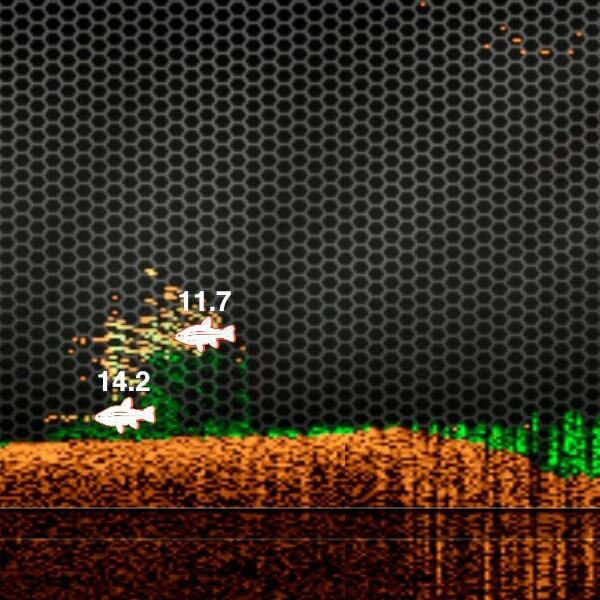 And our lovely Deeper Hero Russ Guise has put his sonar readings to good use! 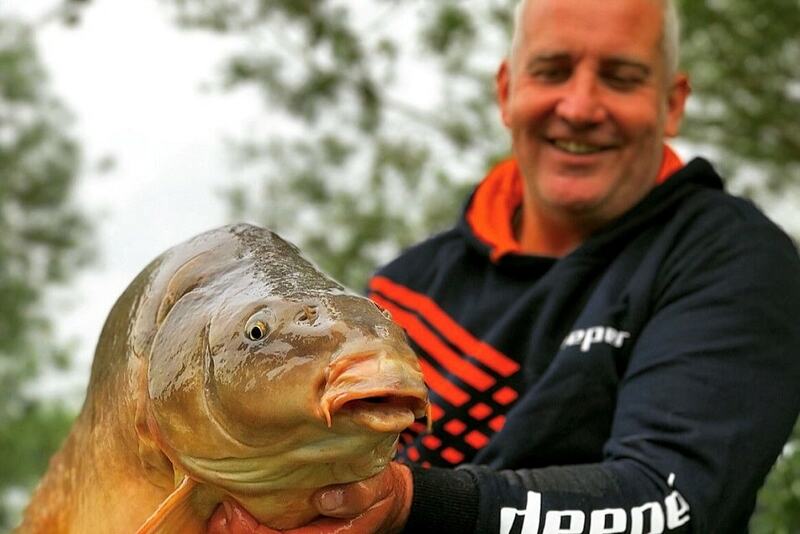 He’s put together a quick guide to some of the best features to look out for, how to spot them on your smartphone screen when using your Deeper, plus handy carp fishing tips for that kind of feature. Like any creature that forages for their food, carp learn very early in life where natural larders of food can be found. And it’s these locations that regularly produce captures of carp. These are the places carp anglers endeavour to find to place a baited rig. Over the years, trial and error has taught me what to look for to track down such productive feeding areas. The key is finding certain lake bed features. In recent times I have been able to locate these features more reliably and effectively by using my Deeper PRO+ instead of the standard marker float and lead set ups I’d use previously. It’s a great bit of carp fishing gear. So, here are 3 great features to target, and how the Deeper shows them on your smartphone screen. These can be as little as a 6 – 10” (250mm) deep depression, and as small as a few feet across in diameter. These little hot spots are quite often actually created by the fish themselves feeding repeatedly on the spot over a long period of time. Some have small inflows of water from underground springs, some are in a sheltered location with naturally occurring food like bloodworm or other fly larvae. But wherever I find one, I know I’ll be confident of having a few fish from it. Here’s how a depression will look on your Deeper display. For scans like this, you just need to cast from the shore and reel back in. These little spots are the perfect places to fish single hook baits. This makes them ideal for short or winter sessions but that’s a whole other subject. Here I’m talking about features like gravel / clay humps or plateaus. These are some of my favourite features to look for. Unlike small depressions, in general these larger areas are fairly devoid of naturally occurring food sources for much of the year. But that doesn’t mean the carp won’t come there to feed, it just means that dinner is on you. These spots are absolutely perfect to use as a kind of dinner table for the carp to feed off. All they need to do so is wait for some obliging angler to provide dinner in the form of introduced free offerings!! These are the kinds of features that can (and regularly do) give multiple catches of fish in one session. This is mainly due to the fact that you can introduce free offerings in sufficient amounts to promote competitive feeding situations. Here, many fish are likely to feed together at the same time. This increases competition for your free offerings and means the carp will have a less cautious approach to your bait. Here’s a nice plateau with a couple of fish feeding on it shown on the Deeper PRO+’s display. The PRO+’s lake mapping function from the shore is also a nice way to locate these large features. It uses GPS to map out the water, and you can even view these maps on your computer at home. Carp fishing tip for fishing big variations in lake bed topography – Get all 3 rods into the action! An often neglected feature at any venue is the marginal shelf. EVERY lake has one. In fact, it’s probably going to be the biggest feature in most lakes. Yet for some reason it will get overlooked by a large percentage of anglers (especially on the larger lakes). Ironically, a lot of times the marginal shelf is THE best place to put a baited rig. First up, these are natural food larders. Second, due to their contours they are obviously fantastic natural patrolling routes for fish to follow when on the move. In other words, these are top feeding areas. Here’s a weedy marginal shelf shown on the Deeper. The arrow shows where I would present my rig. Scans are automatically saved and you can view them in the Deeper App using the History function. That way you can look back over scans and find exactly the right spot. Carp fishing tip for fishing marginal shelves – weedy margins make great ambush spots! On waters where weed grows well, it’s not uncommon to find a deep margin acting as the natural boundary of the weeds extent. A deep margin with a wall of weed that stops at a given depth creates an incredible ambush area for patrolling fish. A rig placed correctly on this type of feature will rarely go uninspected. So there you have it – a quick guide to some of my favourite carp feeding hotspots. Find these spots and you’ll see plenty of action. The Deeper PRO+ is a great tool for locating these features – frankly, it’s the best feature finding kit I’ve ever used. Hopefully these pics will help you interpret the data from your Deeper and find those perfect spots. Thanks for reading, until next time friends.